January 8, 2019 , Vancouver, B.C. – TerraX Minerals Inc. (TSX-V: TXR; Frankfurt: TX0; OTC Pink: TRXXF - https://www.commodity-tv.net/c/search_adv/?v=298245) is pleased to announce that 2018 exploration programs delivered concrete advancement of targets at the Yellowknife City Gold (YCG) project. While continuing to deliver high grade surface results, TerraX compiled and enhanced all data sets to achieve a clearer understanding of the deposits. Analysis and review of the entire district by a panel of internal and external global experts has identified new targets and further defined existing ones. Barney Deformation Corridor (BDC), Crestaurum and Sam Otto are the top three targets which will be the focus for expansion of gold deposits. Homer screened as a new high potential target and will be the focus of confirmation drilling. All four targets lie within 5km of each other in the Northbelt Core focus area of the project. Figure 3 These data driven targets are the highest potential and highest confidence targets that were the result of the comprehensive work completed by our expert panel. 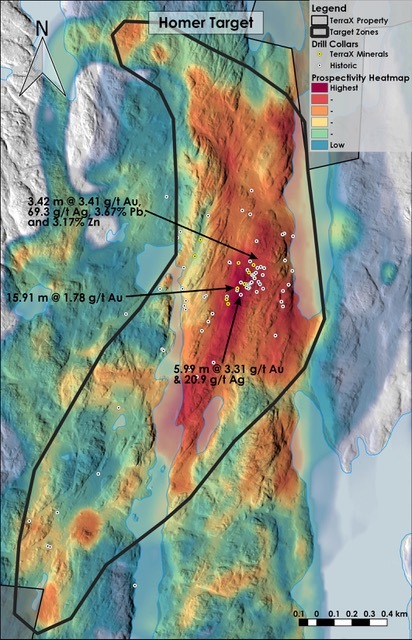 BDC Figure 4 (Barney Deformation Corridor) is an extension of the Giant gold system with 3 parallel north/south structures over 1km of strike intersecting with Crestaurum. It features abundant high-grade rock samples on surface. There has been very little drilling over the majority of this shear zone at the intersection with Crestaurum making this a strong new target. Crestaurum Figure 5 continues to be a top priority target. 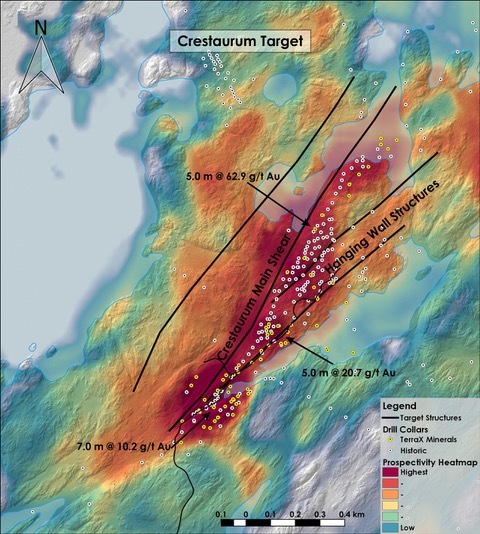 Previous drill success together with strong vectors from surface data including magnetics and geochemistry have identified two parallel structures to the north that are new and largely untested. 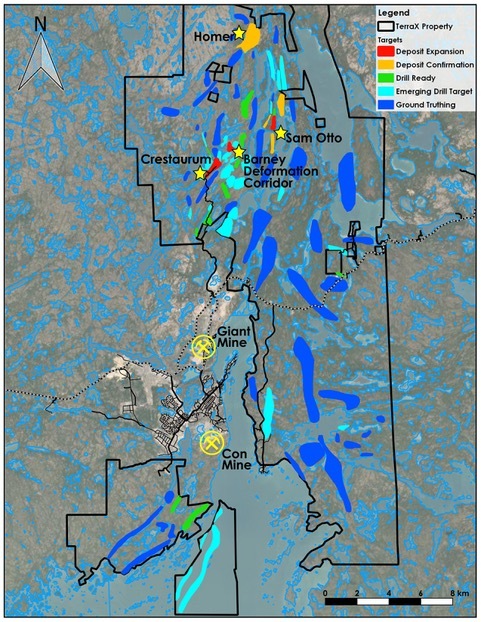 Sam Otto Figure 6 remains a prospective bulk tonnage target with total strike length of 2.5km continuous mineralization. Drilling will focus on further defining the extension of mineralization. Homer Figure 7 is a 2km long and nearly 1km wide target with confirmed strong mineralization on surface. Pathfinder elements and felsic intrusions related to gold mineralization are contributing vectors that make this a very exciting target. This is one of TerraX’s largest mineralized zones, and there is potential for economic gold bearing shears.